In 2008 Tour du Canada celebrated its 20th anniversary. To recognize that event the Board of Directors announced a project to help young people participate in the cross-Canada ride. Although we strive to make Tour du Canada as affordable as possible finding the funds to participate can be challenging for young people who have not started their working life or have loans and fees to deal with in pursuing their education. We want to encourage participation amongst this group of individuals because often once having completed their education they do not have the time or the resources to participate. Thus many need to wait until retirement or they obtain seniority in their employment in order to participate. Tour du Canada has become a popular GAP year activity for young people around the world. Funds, in the form of a bursary, will be available to students and recent graduates 25 years or younger who are participating in Tour du Canada. The Board of Tour du Canada will make the final decision on who is awarded a Bursary from the general bursary fund. Names of applicants are not included in the information provided to the Board. The Board reviews the submissions and makes its decision based on the merit of the applications. Each Board member has a vote and the majority agreement decides how funds are allocated. The Board of Directors is elected annually by the membership of Tour du Canada. Donations to the general fund will be used to award bursaries to any eligible applicant. All applicants are eligible to receive proceeds from the general Bursary Fund. Donations to the dedicated fund will be in addition to any funds awarded through the general Bursary Fund. In order to accept a Dedicated Donation the proposed recipient must be confirmed on the tour and must have been approved as a recipient of a Bursary. We will not process dedicated donations until such time as the participation of the individual is confirmed. Amounts of Dedicated Donations will not be publicized, nor the name of the recipient. Only the name of the Donor. Funds received by Dedicated Donations will only be awarded to the proposed recipient. If for some reason the proposed recipient does not participate in the Tour the donation amount will be returned to the donor. 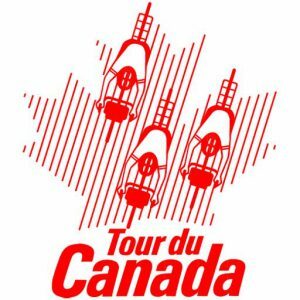 Tour du Canada is a non-profit corporation. The tour is designed as a no-frills event. Tour riders become members of this co-operative organization. The Board of Directors is elected from the membership. A Tour du Canada ride is a shared experience that allows cyclists to see Canada at a human scale and meet people from all of its regions. Being part of a group provides individuals with the confidence and resources to meet their goals and makes possible a trip that many would not contemplate on their own. You can now make a general donation to the fund or specific donation to an applicant.